Written by Will B. Johnstone; Adapted by Noah Diamond; Directed by Trav S.D. Aristotle Stamat, Noah Diamond, Melody Jane, Robert Pinnock, and Seth Shelden in I'll Say She Is. Photo by Don Spiro. BOTTOM LINE: 90 years ago the Marx Brothers performed I'll Say She Is as their Broadway debut and today Noah Diamond presents us with a revival that will keep you in stitches. I was unable to breathe. Laughter was emitting from every crevice in my body. It wasn't just me. From every section of the audience there were howls, cackles, and giggles. 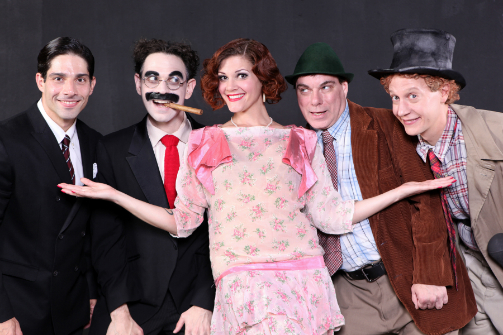 Whether “playing in the courtroom,” (Not “courting in the playroom!”), or chasing after dancing girls, this production does honor to the Marx Brothers' name. The story follows Groucho (Noah Diamond), Harpo (Seth Shelden), Chico (Robert Pinnock), and Zeppo (Aristotle Stamat) and all of their delightful shenanigans. It is posted in the newspaper that Beauty (Melody Jane), the niece of snooty Ruby Mintworth (Kathy Biehl), is looking for a thrill. The man who can thrill her and fulfill her suppressed desires will be rewarded as Beauty is a millionaire. It is Zeppo who catches her eye, but she wants to experience everything New York City has to offer. Central Park, gambling, Wall Street, and draperies. When she comes upon the Opium dens in Chinatown trouble brews and she finds herself accused of capital punishment, or “20 years in Albany” as Groucho suggests capitol punishment. Though there is clearly a through-line, this musical is in the style of a revue. Each song and scene could be a skit in itself. The humor is integrated into every aspect of the show, doing justice to these kings of comedy. If you are not familiar with the humor of the Marx Brothers, be aware that it is fast paced. Wordplay is the basis of a lot of the brilliant jokes and the double meanings, silly nature, and suggestive looks keep on coming with the characters as well as with this spectacular revival cast. Granted, slapstick is in no short supply as they wonderfully perform ridiculous antics: standing on chairs, cutting ties in half, and the like. Paying homage to a great era of comedy, this production reawakens the spirits of legends.